Feeling encouraged by hours upon hours of watching Colette water marble, I decided to give this technique another try. The last time I attempted a water marble, I was in the middle of the 31 Day Challenge, and I got so frustrated trying to make it work that I was practically in tears. As you can see at that link, I got it to work enough for it to qualify for that day in the challenge, but it wasn't mindblowing by any means nor was it even good enough for my picky personal standards. Thankfully, this time I got it to work! Last time I attempted this, my polish wouldn't spread out at all, and dried way too quickly. I tried everything -- a million brands, finishes, water sources, water temperatures, even locations at my house. I attribute my success this time to using a water source that I hadn't tried before. I got out our Brita filter and used freshly filtered water to marble. It even worked better than the drinking water I tried last time. 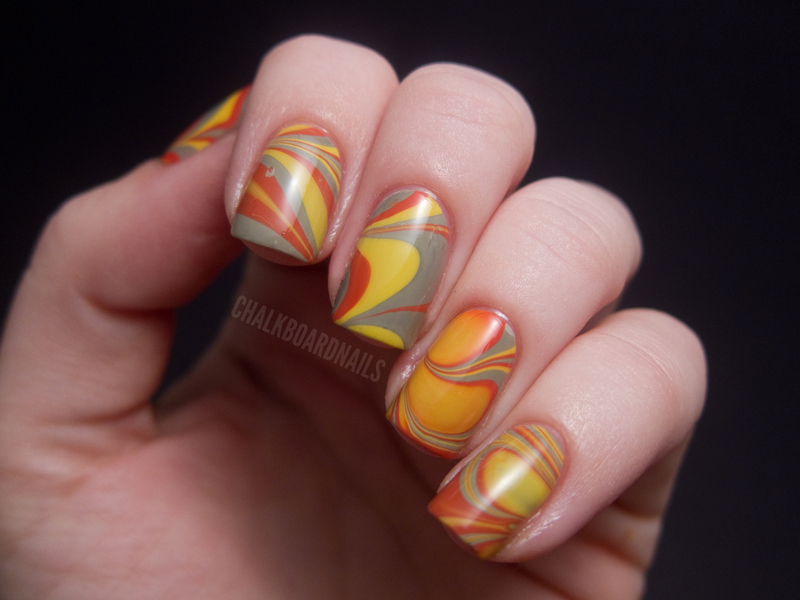 Here's a great comparison by Colette on using different water for marbling. Here are the colors that I used. As you can see, the marbling wasn't very consistent from nail to nail, but I'm really pleased with it anyway. I am still learning the dragging techniques needed to form certain designs. Want to know how marbling works? 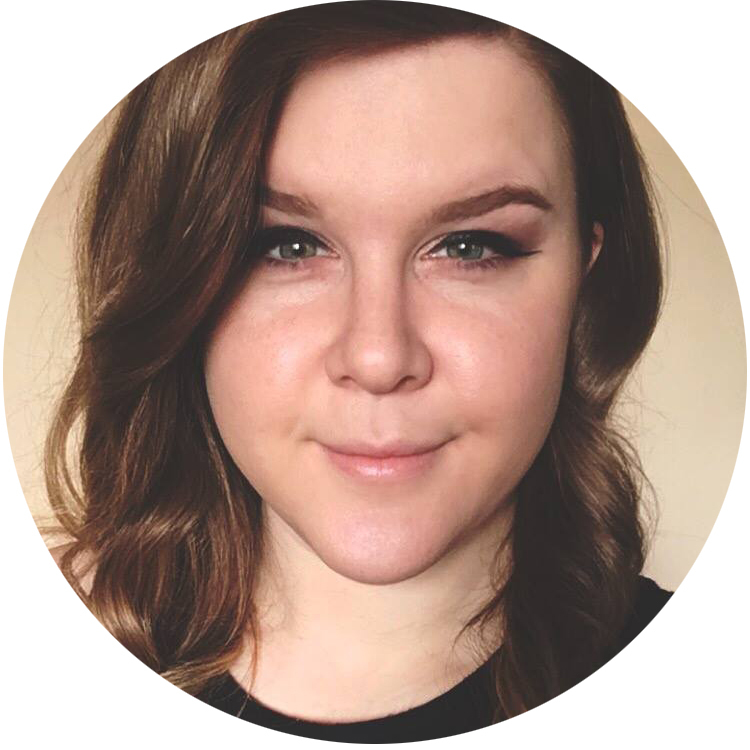 Check out Colette's YouTube channel. She has a TON of excellent tutorials that really helped me. Appreciate nail art like this? Read my plea to support NAILgasm, a documentary about the evolution of nail art (only 8 hours left to pledge). I always end up with bubbles galore. I usually end up with one or two nails I like but I get so annoyed I almost never do it. She really is an inspriation, huh? This came out great! I use bottled water (store brand) and it works for me. I love your color combination. So pretty! I love the ring finger!! 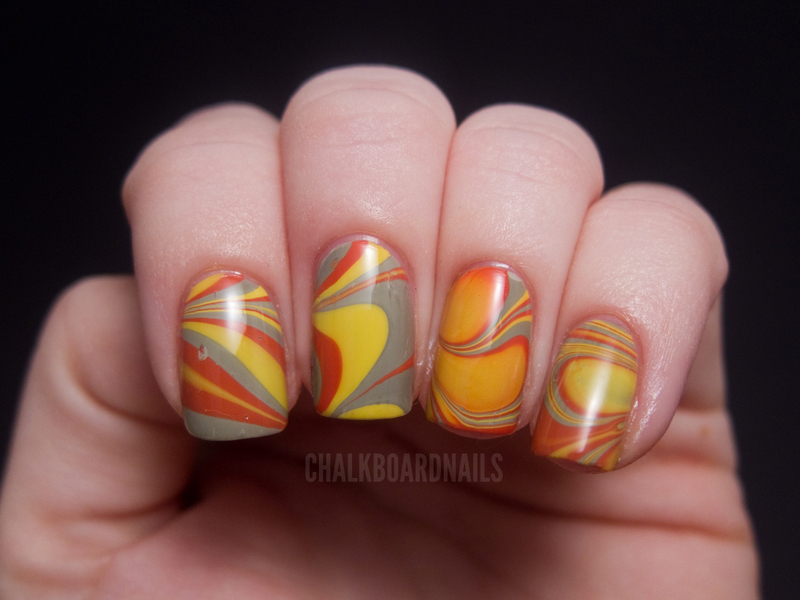 I love marbling! But it's just sooo messy >< You did a fantastic job though! and all the colors are so clear too. This looks really pretty! I love water marbling, but it is messy and so I don´t do it very often. Very pretty! I had so many bubbles when I did it, it was frustrating! I love the colours you chose, so pretty. oh the colors are so great! i have only tried water marble two times and i think is really pretty but is kind of hard to get the right room temperature and the correct polishes.. I love the unusual color combination, and the pattern is to die for. You really did an awesome job. I'm tooo scared to water marble. Nice color patterns. I can't ever get it right. I have just given up. I did my first watermarble for St. Patrick's Day and my coworkers went gaga for it today when they saw my nails. I sent them all a link to Colette's YouTube since that's how I figured out what to do. She's got some major skills! I'm glad you weren't moved to tears with this try, your nails look great! Those colors look awesome together and the marble really looks great! I especially like how the design came out on your middle finger. I've only marbled a few times myself, but I always use water from my Brita pitcher. In fact, I usually run a cup of water through the pitcher a few times before I use it to marble. Colette's videos were one of the main things that got me hooked on nail art and obsessed with polishes. The user SayAnythingBr00ke on Youtube has a really good tutorial that mentions a lot of things that can frequently go wrong with water-marbling and how to correct them. Of course, I am not disputing Colette as the water-marble queen...she is awesome! love these colors together, beautiful! I definitely subscribed and thanks for the recommendation! I've had such troubles myself and I refuse to give up on it because water marbling is just too darned cool! I like this color combo too. I also like it that it's not the same on each nail. 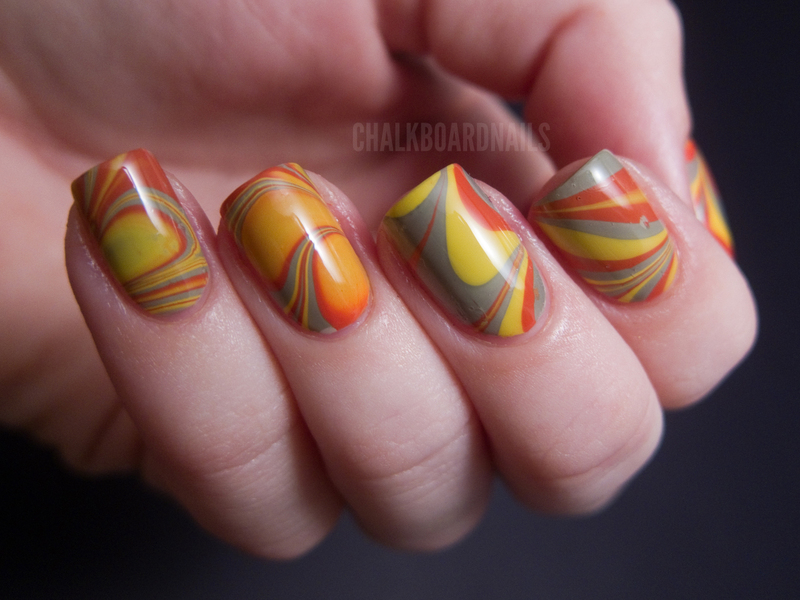 I'm still really intimidated to try water marbling, but man it looks so awesome I need to try it! I'm going to watch some of the videos to get tips, thanks for sharing! Good job! I haven't gotten marbeling to work for myself, but thanks for the tip with the water! I think you chose really great colors! This came out great! I love the colors you used. I'm wearing Recycle right now, lol. I love it, so gorgeous! Congrats on your first successful water marble. You did a great job. Love the color combination as well. Thank you I thought I was the only person who had the problem. I used regular water too. Next time I will def use filtered water. Those colors are awesome. I have found that the room temperature filtered water works best. I got one of those 60 cent gallons from walmart and keep it under my table so its ready whenever I need it. I have also heard either tape around the cuticle and finger that gets dipped or use vaseline or chap stick to help make the clean up easier. It can be messy but the outcome is so pretty! And for bubbles, you might be taking the finger out too soon. And make sure you pull up the extra polish before you take the fingers out. just some things that have helped me!! !